Wow, did you see the ending to week 12 in Cleveland? Who had a blocked FG returned for a touchdown to end it? If you say you did well you sir are a liar! What a way to end a game and a week of football that had ups and downs all over the field. I mean Thanksgiving alone was a catastrophe the first two games with Eagles getting blown up by the Stafford/Johnson connection and then Dallas had Tony Romo re-fracture his collarbone for the second time this year. Even if you dislike Romo, you got to feel bad for the guy. He comes back and Dallas looks like they could make a run in the sad NFC East and it's all over in the blink of an eye. I guess maybe it's a consolation that Dallas will now likely have a top 10 pick in next years draft. Villain: This weeks villain is someone who started off the year on a tear, posting 26.7 points in weak two alone. Then he got hurt for a few weeks, but again came back posting three straight 10+ point performances. That is until this week when he and the steel curtain were ripped open and torn apart by the Seahawks and Russel Wilsons arm? Yeah, I was just as surprised seeing Wilson threw 5 TD's as you were. The reason being because the Steelers defense had been solid lately and it was do to guys like this weeks villain Ryan Shazier. Yes, I know Shazier left the game in the second quarter with a concussion, but up until that point he hadn't done much anyway. He assisted on one tackle and just didn't look like he had a feel for the game. I realize you can't always forsee injuries also, but when I am spending over $7000 on a guy I am hoping he plays the entire game or at least gets a few points before anything happens. That may make me the villain, but just like when a star offensive player goes down for fantasy players this injury hurt many people on the scoreboard this week. 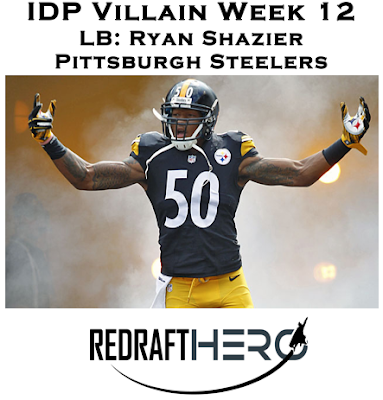 I hope Shazier's concussion isn't to bad, but it doesn't save him from being Week 12's IDP Villain. Hero: Who knew we would have a hero emerge in the first game of the week on Thanksgiving? Well, we did and this guy looked like a lion that couldn't be tamed by the Eagles O-line. Ezekial Ansah was an absolute monster posting 3.5 sacks to go along with forcing and recovering a fumble for an impressive 24.2 points this week. 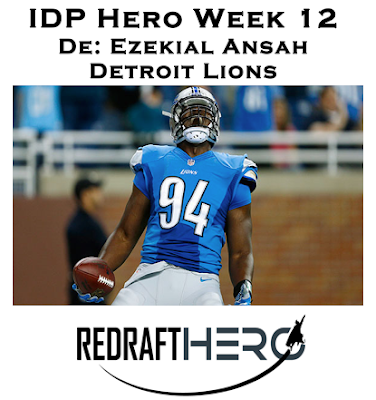 If you haven't yet make sure to check out Redraft Hero and play their weekly IDP contests.